Since I've heard Kabang story from the start, I know that it can really awakes the heart of all Filipino people, and also those who can heard its story. A heartfelt story which can touch our hearts and awake our love for all animals that surrounds Us. Even the Provincial Government of Zaboanga City give its sympathy on Kabang's great did. A resolution passed with the Provincial Congress to give honor on Kabang Heroics did. Also the city veterinarian office was told to do all things to secure the health of the Dog. 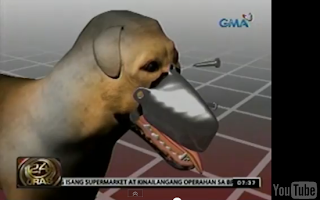 According to Dr Wenceslao Ortiz ( Administrator of De la Salle Veterenary Hospital ) apparently it can not affect the wounds from its face on its pregnancy but Kabang still need to take such medicine and vitamins inorder to keep Kabang healthy, so that it can have strong body when the time of its labor, and also to have healthy puppies. After its pregnancy, there will be a surgery for kabang chipped face, it maybe done with a prosthetic on which a prosthetic is made of molding stainless steel plate that looks like its upper lip, and it might also fit on its upper lip joints so that prosthetic can be use on swallowing foods. Prosthetic will be screwed on its head. But the problem is there is no place here in Philippines that make that kind of prophetic, and needs a lot of money. Another things to do is simply get some skin on other parts of its body and cover it on its wound. It is important to have surgery so that complications shall be avoided. Doctor said that the wound is near on its brain, so if there will be a complication, the most affected part will be its brain, and it can affect on its thinking ability or such meningitis. The problem now is where to get financial supports for this kind of surgery? Hope there will be such good person to help Kabang financially.